The Acid Atom Maduro features Drew Estate's top secret blend of herbs and botanicals, but unlike many other Acid cigars, the taste of the tobacco is much more apparent, thanks to a robust, toothy Maduro wrapper and Acid's signature blend of lush Nicaraguan tobaccos. A stand-out smoke in the Acid Gold line, Acid Atom Maduro offers complex taste with notes of rich tobacco, roasted cashew, coffee, and hints of brown sugar in a traditional 5x50 Robusto size. Even steady smoke cool to the end. Very good smoke. Even my wife liked it! My favorite. Order these you will love them. Mellow. So far my favorite Acid cigar and maybe my favorite cigar. Not too strong. Great flavor. Good mechanics. 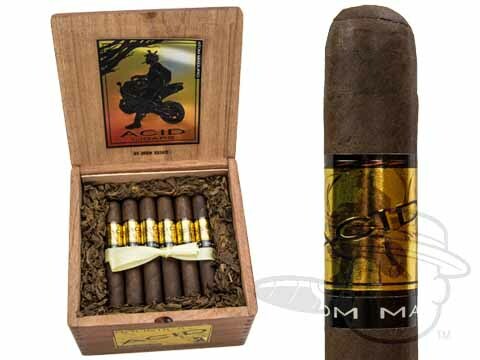 Acid Atom Maduro is rated 4.3 out of 5 based on 8 customer ratings.